I have knitted this garment in a new yarn I received from my supplier, called «Thin Merino Wool». It has approx. the same thickness as Lanett and can used the same way. It is a lovely yarn. I got several beautiful colors in this lovely yarn, and I decided to knit these clothes in pink and lilac. Colors most little girls dream about I believe! ... round the edge. The dress has raglan decreases. So many ask for pattern knitted with raglan or knitted so you do not need to sew the sleeves to the dress. When it is knitted, it is done. Along each raglan decrease, there are 2 sts. Follow pattern and knit these sts like braids by every second row knit the 2nd sts before the 1st sts, then knit the first sts. ... a pattern round the legs. 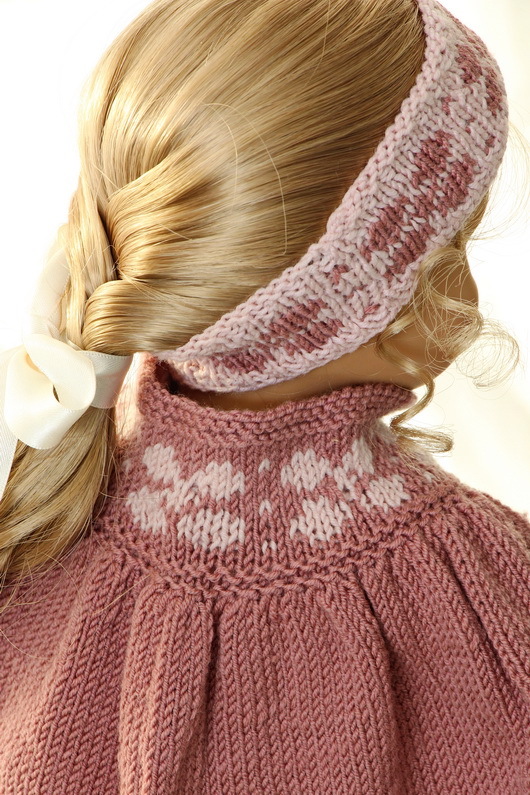 The hairband is knitted with the same row of flowers as for the dress. If you like, Baby born can wear this. However, I prefer a headscarf for her. That is cute as she is more like a little baby. The headscarf is knitted in lilac and have the same pattern as the leggings. Both kind of dolls can wear the headscarf though. ... at each side with a nice, pink button. At last, I knitted my doll Alicia a beautiful cape. It is very nice to wear when the days are cold. 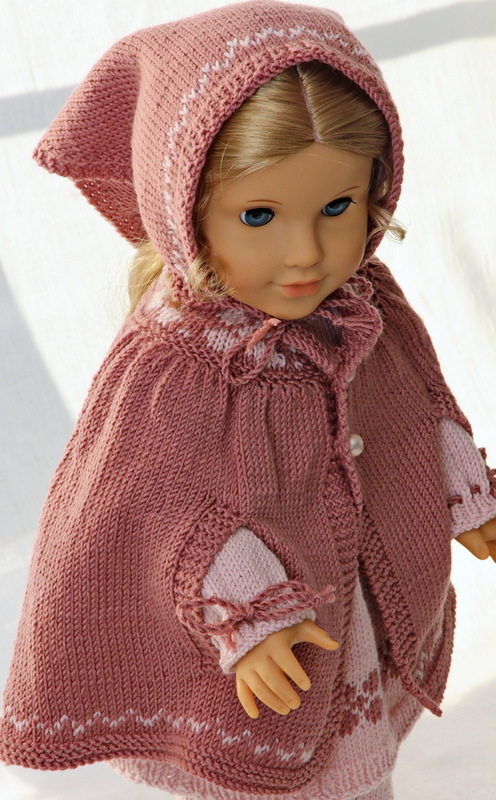 The cape has the row of flower pattern round the neck and it is buttoned with small pink buttons. Along the edge, it has the same pattern as the headscarf. My doll Alicia was beautiful dressed in these clothes. 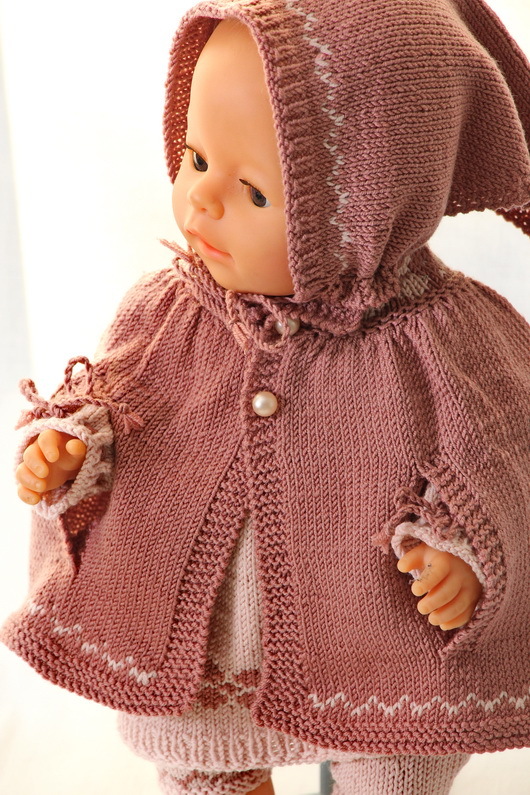 I hope you will love these clothes to and want to knit them for you doll!